Sink and shower drains are easily clogged from debris, food and hair. In particular, when there are ladies in the household, expect a shower drain or bathroom drain to collect longer hair. Buildup in kitchen drains is more of the food and grease variety. Renters, homeowners and landlords can benefit from learning how to address a clogged drain themselves before turning to the services of a professional plumber. Understand more on how slow and clogged drains can be avoided and resolved. Fix Your Clogged Drain Easily. Those using kitchen sinks should never pour grease, cooking oil into a drain. Avoid allowing small food particles to fall inside the sink drain. Besides causing a slow or clogged drain, grease and food buildup can result in a blockage to a sewage and waste treatment system or cause damage to the system itself. Any grease should be placed into containers and then emptied into the garbage. Food scraps and particles should be scraped off of plates and pots and pans before items are washed. •Pour boiling water into the drain every 2-3 weeks. Slow and clogged drains can reduce the lifespan of drain pipe with the unnecessary addition of excessive pressure. Avoiding the problem is the best way to maintain the integrity of drain pipes and sewage systems. •Use of a plunger. A non-flanged plunger is used for bathroom tubs and sinks, and a flanged plunger works well for kitchen sinks and toilets. •Use of chemical drain cleaner. Read directions carefully as chemical drain cleaners may not be suitable for all situations. Also know that a chemical cleaner may leave some of the clog behind, allowing the clog to reoccur. Chemicals may also cause breaks and leaks in pipes through their reaction with iron. Wear protective gloves and eye protection. •Purchase an auger or plumbing snake. This long and flexible pipe can physically dislodge clogs or pull them out of the drain. 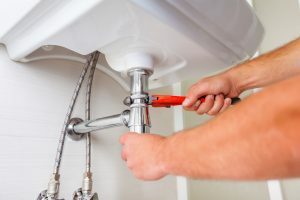 When these strategies do not work to remove a clog, a professional plumber is recommended to examine the extent of the issue and handle the clog and any other related plumbing issue. It is useful to learn how to prevent and remove a clog before an issue happens. Few hardware stores are open round the clock. Purchasing a small snake or chemical drain remover in advance can address such problems in the middle of the night or in the early morning hours. Prevention is strongly recommended to avoid additional pressure and wear on necessary drain pipes. Contact us to schedule an appointment to unclog your drain today. Tags: clogged drain and fix a clogged drain. Copyright © 2016 Top Dog Plumbing. All Rights Reserved. Site designed by V-Squared Creative.